In June I attended a Shoebox Swap for Stampin’ Up! demonstrators hosted by my wonderful upline Brian King in Atlanta. You can read about it on Brian’s blog. I had learned how to make a Sunburst card the year before and decided that might be a good technique to take to the Swap. Here is the card that I made for the Swap. It was a hit at the swap and I quickly realized that even some demonstrators are not aware of how the card is made. A number of people have asked for a tutorial on this technique so I decided to make a video. 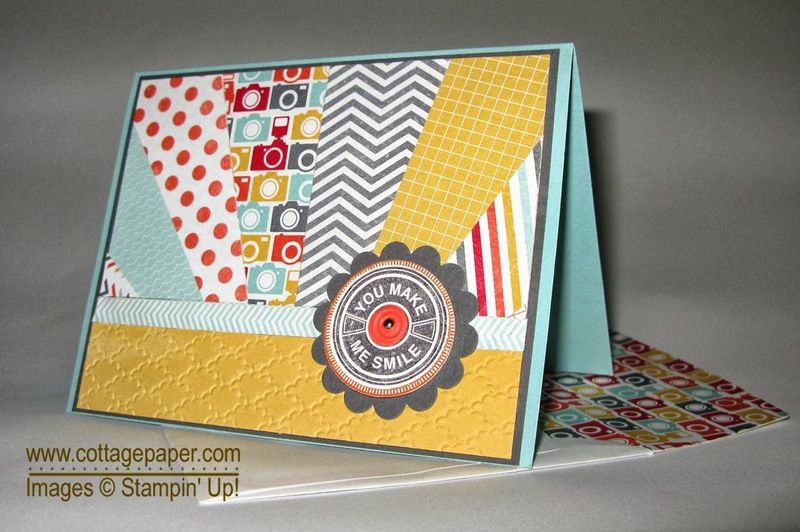 Like many things this card is easy to make once you know the technique! A few weeks after the swap I wanted a card to send to one of the granddaughters who was at camp. I decided to make a Sunburst card like I had made for the swap. Since it was for a young girl I decided to step it up a bit! I put pewter embossing powder on the You Make Me Smile piece (I would have done that for the swap if I had thought of it sooner!) and added some silver glimmer paper. What an amazing tutorial, Katie! You are very thorough and precise. I love it! And you already know I love that card. Your card is beautiful! Now I can make a sunburst card! Enjoyed your tutorial. Thanks for sharing.